Considering getting a Chesapeake Bay Retriever? The Chesapeake Bay Retriever originated in the USA. Interestingly, its ancestors are believed to have been the rescued puppies in a Chesapeake Bay, Maryland shipwreck in 1907. 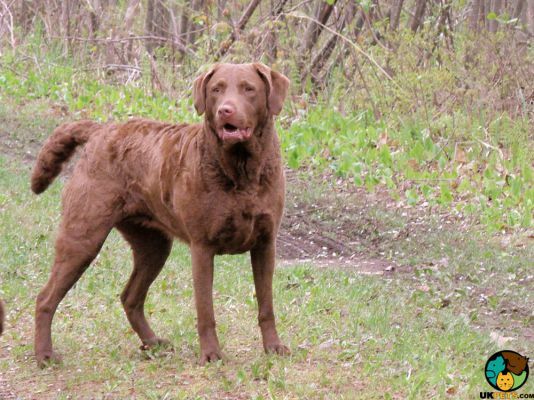 Standing 56 to 66 centimetres at the withers and weighing 65 to 80 pounds, the Chessie has a classic retriever look, yet it has a broad head with a medium stop and thin lips that do not hang. This breed is registered with The Kennel Club and other major breed registries. Are you thinking of getting a Chesapeake Bay Retriever? Here is a brief background of this loyal, courageous and happy large dog. In 1807, two puppies similar to Newfoundland dogs were rescued from a shipwreck in the Chesapeake Bay of Maryland. These water-loving puppies, which grew to be great duck hunters, were bred with local retrieving dogs. 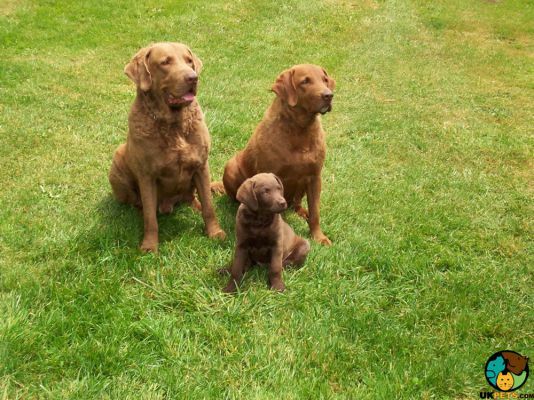 The resulting puppies are believed to be the ancestors of the Chesapeake Bay Retriever. Other breeds used to develop the breed were the Curly-Coated and the Flat-Coated Retrievers, Coonhounds, and Irish Water Spaniels. The Chesapeake Bay Retriever’s strength, stamina, sturdy build and dense coat allowed it to successfully work in rough, icy waters. Breed standards were established in 1885 and the Chessie only arrived in the UK in 1933. It is recognised by major registries, including The Kennel Club here in the UK under the Gundog group. Since the 70s, the breed has been a popular gundog as well as a companion and family pet. The Chesapeake Bay Retriever has a classic retriever look, sporting a muscular body with a short slightly wavy hair and hanging ears. A major difference is its broad head with a medium stop, thin lips that do not hang, well-developed nostrils, and webbed feet used for swimming. Chessies have medium eyes that are set wide apart, a strong jaw with a perfect scissor bite, and a moderately long neck. The colour of their nose and lips depend on their coat. Males are easily distinguishable from females. The average height is 56 to 66 centimetres and weight is 65 to 80 pounds. Chessies are large dogs that boast of a unique coat comprising of a harsh, oily outer coat, and covering its entire body is a fine, dense, woolly and weather-resistant undercoat. This combination provides the right insulation that enables the breed to hunt in all conditions even in ice and snow. The hair in its neck, shoulders, back, and loins is wavy. A little feathering on its tails is permitted. Accepted colours according to KC standards are ash, brown, light brown, dark brown, dead grass, and sedge. These colours allow Chessies to camouflage in its surroundings, which is specifically helpful in hunting. 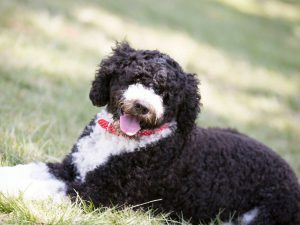 Although this breed sheds heavily in the spring and autumn, grooming is relatively easy because it does not need to be taken to a professional groomer for trimming or clipping. Regular brushing will take care of the dead hair and distribute natural oils. A warm bath will also be beneficial during shedding season. 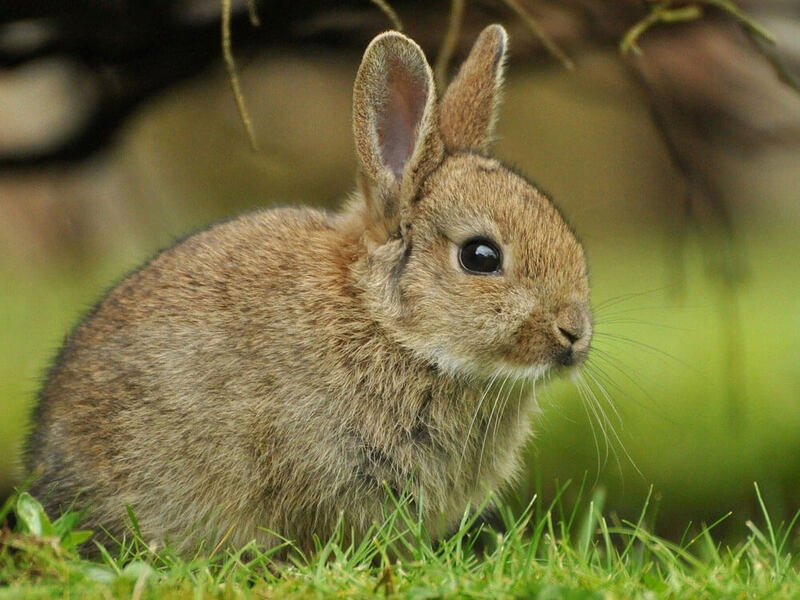 Apart from caring for its coat, also pay attention to its teeth, ears, and nails. Some owners tend to ignore other aspects of grooming and only focus on the coat. Also check your Chessie’s skin for abnormal spots and fleas/ticks. The Chesapeake Bay Retriever, like other retrievers, is a happy, affectionate and loyal companion. It has a natural compassion toward children but won’t put up with too much pestering and would rather walk away. It not recommended for families with very young children as it tends to be protective of its food and toys. It may also wrongly judge boisterous play as danger. However, as a breed that matures late and develops protective tendencies at around three years old, early training and socialisation will help control unwanted behaviours. Chessies usually get along with other family pets but can be aggressive toward animals they do not know. As a working dog, the Chessie is courageous, alert and hardworking, which characteristics also make it a good watchdog. As an outdoor breed, it is not suited for city apartment living with families living sedentary lives. It thrives in the countryside where it could roam around and explore. Don’t let its retriever lineage fool you. It is not as even-tempered as its Labrador and Golden cousins. It can be stubborn and may test your alpha role. It is best suited for experienced owners that are firm and consistent. 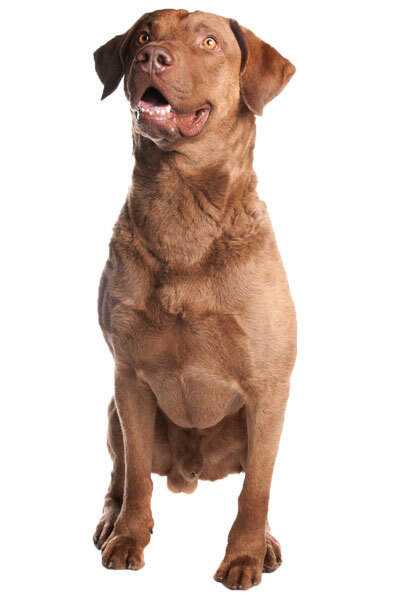 A typical serving for an adult Chesapeake Bay Retriever is 2 to 2.5 cups of excellent quality dry dog food per day. Ask your trusted veterinarian regarding the frequency and amount of food as they can offer helpful advice. As active working dogs, Chesapeake Bay Retrievers need more protein and less carbohydrates in their diet. This is to support their high energy requirements. A good guide will be having a diet composed 80% meat and 20% vegetables. Experts suggest a grain-free diet to avoid skin allergies and stomach problems. As for supplements, Glucosamine and Chondroitin Sulphate are important for the joints. Also ask your vet regarding supplements that would decrease inflammation and repair/strengthen tissues for your active dog. A properly cared for Chesapeake Bay Retriever can live up to 13 years. It is a generally healthy breed but like other dogs, it could have hereditary health issues. For instance, it is prone to eye problems like cataracts, Progressive Retinal Atrophy and Entropion, as well as joint and bone issues like Hip and Elbow Dysplasia and Degenerative Myelopathy. It can also develop Umbilical Hernia, Von Willebrands Disease, bloat and ear infections. Chessies have extremely high exercise requirements. It needs at least 2 hours’ worth of physically and mentally stimulating activities or it will display destructive behaviour. Aside from allowing it to freely roam around a fenced yard, let it engage in sporting activities such as agility and obedience trainings. Being in the water will also make this breed truly happy. Some people are not aware that raising a dog is financially challenging. Aside from buying a well-bred puppy, the expenses just continue to add up as you try to provide it with a good life. Obtaining a well-bred Chesapeake Bay Retriever puppy isn’t as easy as popular breeds since it is rare in the UK. You have to be on a waiting list and would need to set aside at least £800 or more. To make your dog comfortable in your home, you need to buy basic equipment and supplies, which will set you back around £200. Food and treats will be £60 a month. Routine veterinary check-up costs to keep your dog healthy will cost as much as £1,000 annually. This does not even include additional expenses if it gets ill and would need surgeries or long-term treatments. This is the reason why you need to get pet insurance. Monthly costs start at £20 for basic and £50 for lifetime, depending on the premium you choose. Is a Chesapeake Bay Retriever Right for You? 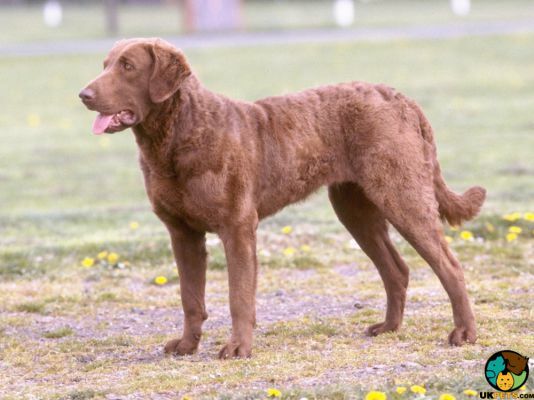 The Chesapeake Bay Retriever is a loyal, hardworking and courageous breed. As a working breed, it thrives in the countryside and loves to do outdoor activities with its owners. It is not for first-time owners and families with very young children. The breed sheds a lot at certain times but does not require any special grooming procedures. It is not for families with sedentary lifestyles who live in city apartments.